Three types of MeetH2O are currently available. MeetH2O-W and MeetH2O-D both measure the groundwater level, but with a acoustic and pressure sensor respectively. MeetH2O-Ec measures the groundwater’s conductivity. The sensor and measurement pipe are connected and subsequently placed into a groundwater well at fixed distance to the ground surface level. The sensor is placed such that it is located above the water surface. The distance to the water level is measured by the sensor by emitting an acoustic pulse, and measuring the sound reflecting on the water surface. The data logger stores the measurements and transmits the data at regular intervals using the GPRS network. The meetH2O-D device consists of a sensor, connected by a cable to a data logger / data transmitter. The device is placed into the groundwater well at fixed distance to the ground surface level and in such that the sensor is located below the groundwater level. 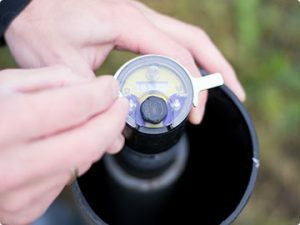 The water level can be calculated by measuring the pressure of the water column above the sensor and taking into account the fixed distance between the sensor and the top of the well. The top of the well is referenced to ground level and N.A.P. (or another national reference level) to calculate the exact water level, which is displayed online. The MeetH2O-Ec is a similar to the MeetH2O-D, in that it is installed below the groundwater level. As opposed to the previously described systems MeetH2O-Ec measures the conductivity of the groundwater. Logging and regular transmission of data allows the client to monitor the conductivity of the groundwater online. This is perfect for application during (amongs others) tracer tests.